While some of our armies parade on shelves or rest in their barrack boxes, others are engaged in a battle that spans the globe. may have noted talk of 2 PBEM Charge! games being hosted by Greg. Since I enjoyed playing in the games and am the stay at home one with time on his hands, I offered to take a turn at hosting and they rather rashly agreed. Ahh bold young lads, listen to your mothers and beware the Recruiting Sergeant! Here's what they have signed up for. Instead of a well known set of rules and a clear scenario with a chance to write turn by turn unit orders they have only an undependable summary, order of battle with vague arrival times and only a handful of cluttered photos on a blog and the occasional brief report to go by and have to issue mission orders to Brigadiers and trust them to carry out the orders, only intervening if right in the thick or observing something in a photo, or hearing reports that suggest they need to issue new orders, encouragement, advice etc. I will be posting to the page after every turn. My hope is play 1 turn each morning and each evening but there may be delays if I need to wait on a crucial decision while family, work and a 12 hour time differential provide "friction". The game is set for 15 turns or 7-8 days if all goes well. Meanwhile, if I continue to enjoy this as much I am at the moment and aren't lynched by the players I will be calling for volunteers for a future game. I still have some detailing, drybrushing and touchups of various sorts to do over the next few weeks but its time for a test game. Atlantica c 1830, or maybe the Eastern Townships of Quebec, near the US border. 4 inch grid on 4x5 table. First pass at painting.Detailing to follow. Yesterday was largely occupied with spousal duties which in this case involved a trip to a social event, not of the wedding variety, an hour & 1/2 away along backroads. Today we gave ourselves the day off. So "make and mend" in modern navy lingo but also in another, older fashion as in making things and mending personal effects. In my case, my wargames table. Last year, I set myself the task of building a sit down solo wargame table. Experiments have shown that while various sizes of grid square are best for various things, 4" was the best all around size for me. I also found that while smaller grids could be made to work, 12x12 was the smallest that I was prepared to accept. At the same time, 12x4" was too wide for a sit down table but that 12x9cm was just possible if one stood up to reach the farthest row. It was one or the other so I chose the sit down table and proceeded. Suddenly I could realized that I could recover some lost wall space for shelves by moving one of my bookcases to the middle of the room and using it to support one end of the table as I had done previously. So I adapted the plan . Once all was done I was happy with the result but it was painfully obviously that while you could perch on a tall barstool you could not sit comfortably and play. It was also obvious that the table was about 6" shorter than the bookcase it rested on and it didn't take long to realize that with the table being several inches higher and geometry and my shortlegs being what they are, I was no longer able to reach all the way across the table, even when I stretched my utmost. So much for the sit down table, I might as well have left the table at 4 feet wide! Ah well. No way to stick the trimmed bits back, press on. Several games later I had proved to myself that the table would indeed work but that my suspicions were right. The grid was a VERY tight fit for many units and much, if not most, of my secenery needed adjustment or replacement. I started thinking whistfully of 4" squares and looking at various scraps lying about waiting and suddenly I thought "why can't I stick a bit on the side? I already patched back on a 2" wide strip?" Restored to 5ft x 4ft. An initial overcoat of paint dulls the old grid and I'm almost ready to start adding a new grid to be followed by detailing later. I need to get it playable by tomorrow night to get ready to host an imminent pbem game. So that's how I spent the morning. 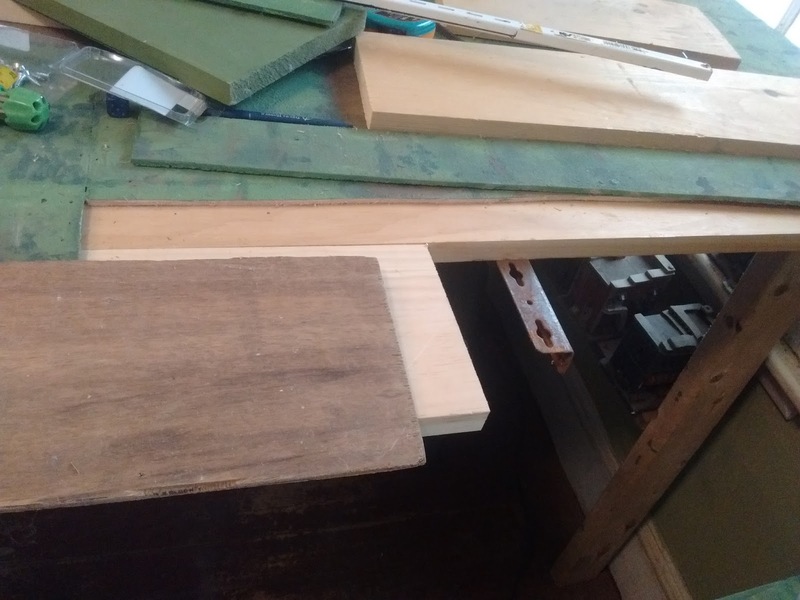 Luckily, being a pack rat I stil had a strip, never even painted, that I had cut off the original 4x8 sheet when building the 6x8 table in 2009, and some more bits of the 1" pine shelving that frames the top, and some metal brackets from a long gone 1979 water bed. (Did I mention pack rat? Its both nature and nurture) Needs a bit of crack filling but its had an overcoat of random green and in an hour or so will be ready for the new 4" grid. 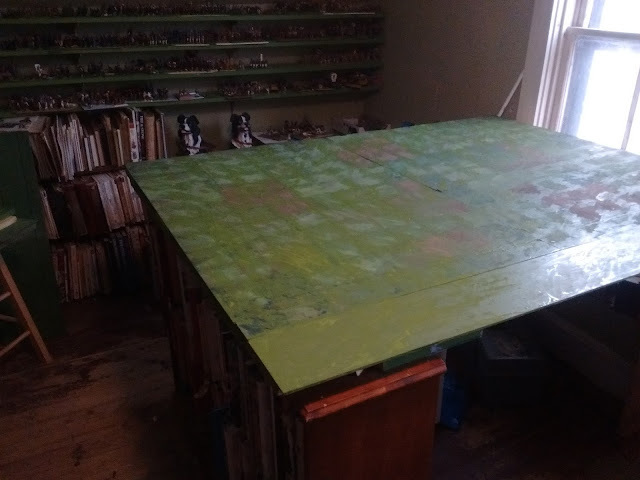 Its only an extra 2.5sqft or not quite 10% expansion but the modified table looks ginormous to me now even though its the same number of grid squares. I might not be so hot at planning but improvising, kludging and mending, I can do. "Well sir, it was a near run thing." "The natives shot straight, a bullet to the head more often than not while they were just as lethal with blade in hand. The poor Gordons and Naval Brigade were wiped out to a man. If the enemy's nerve had held up under artillery fire I'm not sure we could have shifted them but shift them we did in the end." There is room for lots more chrome but the rules provided just the sort of quick diversion that I had in mind. (Quick as in an hour+ playing time for 9 out of 12 possible turns with 5 units per side.) There were enough dice flying to make sure outcomes were always in doubt. The Natives saved their 6's for shooting and melee, the British used up many of theirs testing the effect of hits! (Ouch!). They were however outrageously plucky on morale rolls. 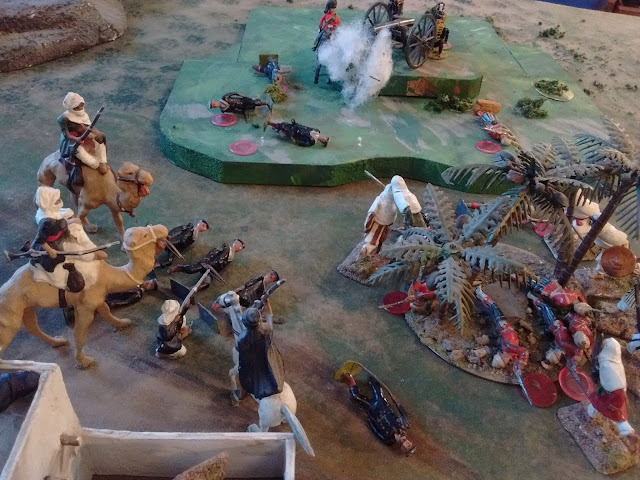 It was nip and tuck until the last turn when the artillery womped some camel mounted infantry which failed morale followed by the Sheikh failing Army Morale. I did some tidy up editing to the rules and am thinking of calling them "Upsetting the Civilians" but name proposals are invited. ** Update. After some post game reflections and trials I've decided to drop the killed/wounded/pinned test or at least make it optional in favour of 1/2 dice at long range 6 vs cover, 5,6 vs open and instead take a morale check if taking any hits from shooting or suffering more hits in melee. Same test but the 1,2,3 result will be pinned if 1/2+ strength or retreat if below 1/2 or in melee. 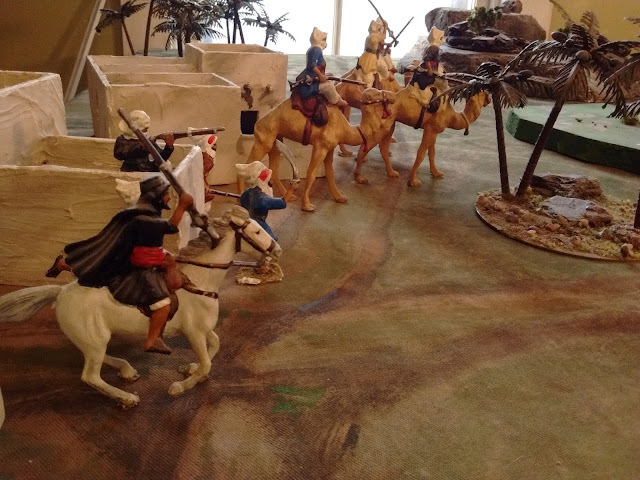 This is now my official 8th Active Period: Old Toy Soldier 1880's Colonials in Nkukhuland and in the NorthWest. The Nkukhuland upgrades will have to wait though till the NW side is done. I may not get at it till 2017 but I anticipate some homecasting and maybe a few purchases from London Bridge in the US and possibly from Dorset in the UK. The internet can be an awful thing, corrupting idle middle aged men and seducing them off into shiny old things. Shiny old toy soldiers that is. I knew hauling out the Britain's again last fall was risky but I thought I had it contained. Then, last week, as I was steeling myself again to list my handful of Soldierpac Britain's Arabs on eBay and explaining again to myself that I don't have room to play those sorts of games any more, when various people (you know who you are!) start posting pictures of just that style of figures and suddenly my plans started to feel a bit curmudgeonly and well, cowardly and defeatist. Infidal! We will NOT GO! Then there was another issue. I really enjoyed the Square Brigadier NW Rebellion game with the old toy soldiers and am looking forward to finally working on some of the figures that have been waiting up to 17 years now. However, I've also been concerned about my pledge to myself that each collection would offer me a different sort of game as justification for being kept. All the 54mm NW game was offering me was some bigger figures in variations of the same period dress and a different theoretical backstory for games that would fit just as well into Atlantica. Enter some comments and email conversations and suddenly I'm thinking about my last rifle armed single figures, the old MacDuff Colonial games and about my newish appreciation for smaller games on a smaller table and suddenly I saw an opportunity. Before there was Atlantica in 40mm there was Nkukhuland in 54mm. The British colony of New Durban to the south, the Zulu like NkuKhu in the middle and the Arab slaver stronghold of Wadifoulyam in the North. That campaign took place in the same world as the historical NW Rebellion games with Imperial units being representations of real Imperial units. In those days, games took place on 60 sq feet with 100 to 500 54mm figures on table. 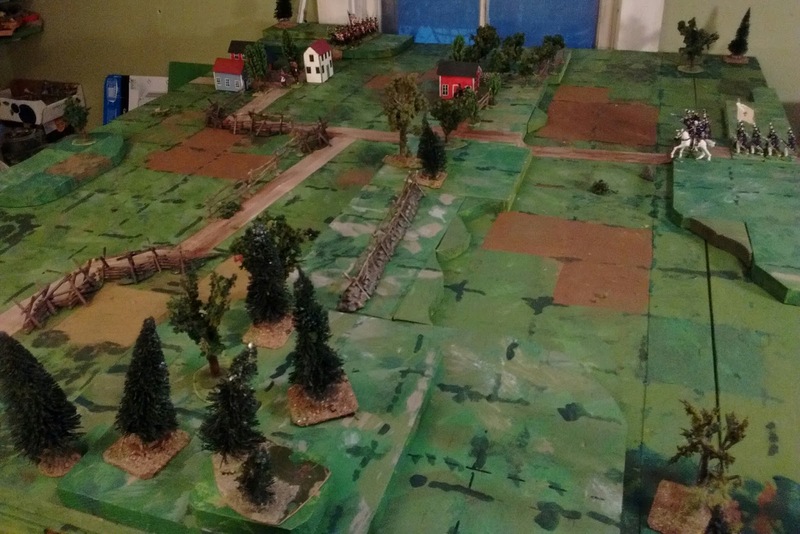 Today I know how to stage smaller Colonial games with simple rules on my current table. The NorthWest Rebellion and Nkhukhuland games would exist as 2 parts of 1 collection providing Colonial skirmish games leaving the 40mm Atlantic setting for gridded battles. Having hauled out the original MacDuff , it had simple rules but it had a lot of them with lots of special cases, modifiers and so on and was always a time consuming game to play but best done with a dozen or so units at least. What follows bears little resmblance to MacDuff to the Frontier except the desire but I'll worry about names later. Used a card deck to track turns, determine initiative and as a chance card deck as per my other recent rulesets. Units 8 infantry, 4 cavalry or gun and 4 crew. Moves based on a stick with 3" bands. Infantry move 3 if in column or native. 2 if deployed 1 if regulars in difficult going. Artillery move 3 limbered. Only in good going. Shooting. No shooting if moved dismounting/unlimbering does not count as moving. Rifles. 6, Cannon 12 Cavalry with carbines 2. Roll 1 die per figure / crew. 5,6 hits up to 1/2 range, 6 only over 1/2 range. Effect. For each hit on a unit roll a die. 5,6 Dead. 1 figure as dead. 3,4 I'm Hit! 1 figure is hit. May not move or shoot except to retreat with unit. Roll again on the player's next turn. 0 I'm OK. Ready for action. Cover. Troops in cover treat odd numbers as saved by cover. Stretcher Bearer! -1 from die roll if a stretcher team, doctor etc is with unit when rolling for a figure that was hit previously. Hand to Hand. If a unit charges into contact, line up figures. Roll 1 die per figure. +1 if character or some sort of scenario or unit bonus or if enemy is pinned. If 2+vs 1, choose which figure/die to use. any negative effect is to the figure chosen. A morale check may be needed afterwards. Unit Morale. If a unit drops below 1/2 strength effective (not dead, wounded or pinned) roll 1 die needing 4,5,6 to stand. On a 1,2,3 the unit will retreat a full move bringing any hit or pinned figures with it. The unit may neither shoot nor move on its next turn. If it reaches the board edge it will leave. Roll again each time the unit takes a hit unless it recovers enough pinned and hit figures. +1 to the die if joined by the Commander. Army Morale. If at the end of a turn a player has less than half his original units on table in good order roll die. 4,5,6 fight on. 1,2,3 retreat off table if possible, if not then surrender if Imperial fighting other Imperial but fight on if Imperial vs native. So far after 6 turns I'm having fun playing and thinking about all the figures I want to work on. No, seriously, there has been real progress on the 1812-1860 front, rules, organization etc, all coming together. face off again in the 1st of 2 playtests. Having reduced the number of separate armies/periods that I'm keeping and bearing in mind my rule that each of the remaining periods must offer a different sort of gaming experience, I have dropped the idea of using small variations on the same rule set for various horse and musket/rifle collections. This has allowed a much easier path to a very different approach to the game even while using some of my goto mechanisms. This new set of rules has strong links to Hearts of Tin but essentially treats each unit as 1 stand like the Square Brigadier did. Tthe sequence of play though is very different, a variation on an old Featherstone one which I tested once with MacDuff. After determining initiative (card draw again in this case) 1 player moves then the other followed by a joint combat resolution. Here, for the first time, I resolve fire and close combat all in one phase using 1 mechanism. My thinking was that since each turn represents some 15 - 20 minutes, worrying about things like who fired first or whether or not infantry charged by cavalry managed to fom square or stood in line to repulse a charge or maybe got run over is beneath the grain. That is stuff for Colonels and Brigadiers, not the Model Major General in command. His concern is the battle plan and the use of reserves and the like. In essence the tactics aren't shown, we, as General, roll some dice and see the result of the attack we ordered. When all is said and done, despite the lack of low level detail, it felt to me more like a conventional "wargame" than many of my other gridded experiments. About 1/2 way through the 2nd test game. Some readers may recognize this variation on a classic scenario. The armies here represent an all arms force of about 5,000 men a side. Red's plan was an attack over the bridge and a holding action elsewhere. Blue's plan was an attack up the center, over the ridge and across the run. Here we see the highwatermark of Red's attack on the left and Blue being driven back up the ridge into the woods in the center. So much for plans. I'm still debating names but this is in many ways a successor to Hearts of Tin and it does deal with armies albeit small ones rather than being a skirmish or Brigade action. Model Major General is another option and I am open to suggestions. It was a 15 turn game. 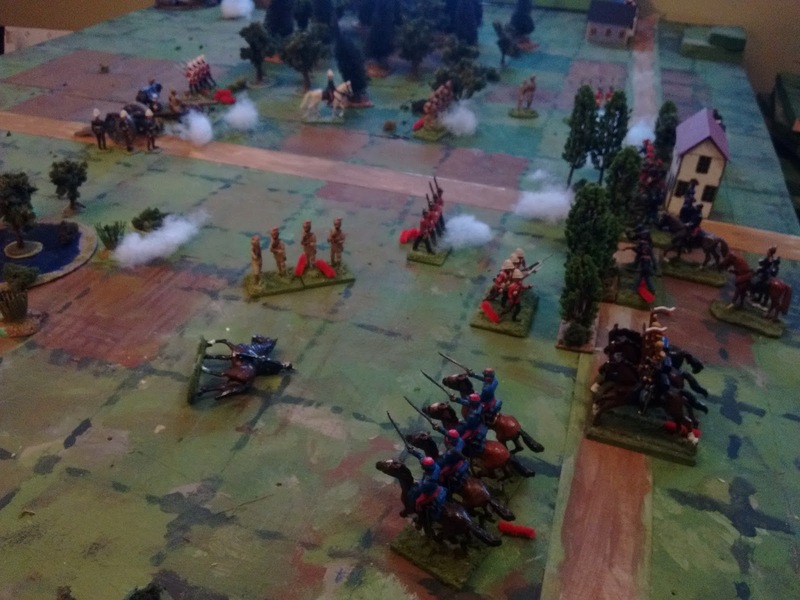 On turn 11 Blue was on the ropes, just a few hits from his break point after a surprise flanking move by Red's right wing cavalry and light infantry overran first one then the other blue battery shattering a regiment of Volunteers along the way. By the start of turn 14 both sides were within 1 or 2 hits from their breakpoint after some devastating counter attacks by Blue's cavlry reserve and some desperate defensive actions by battered Blue infantry units holding patches of woods against superior numbers. By the end of the turn a final all out, do or die assault by Red's rallied units sent Blue into a full retreat. I could and should say more but its late and I'm heading into Halifax tomorrow to deal with another Martian offensive. The final stalemate on the right after assault and counter assault. Oh! Is that the time? 5 days since the last post? What on earth have I been doing all week? Little of interest really with not much hobby time, just a bit of tine for sporadic bursts thinking and rethinking or typing and retyping while doing other things like sitting with bored, snowed in hounds. A friend made a comment on an online forum which has finally jolted me out of my "its not Kreigsiel BUT.." mode, for a while at least so I've been poking about with older versions of The Sq Brig and Tin army as well as trying to line up what I should paint next when I found time. Naturally, everything that is needed fairly urgently to complete anything needs either casting or conversion or both but I had made a small start when the prospect arose of an imminent opportunity to get my musket era lads on table. The ones I was going to leave till spring. So that's what I've been doing all weekend. Finishing the transformation of the Musket era lads from 4 different Red and Blue armies originally designed around units of 24 infantry, 2 guns or 10 cavalry to units that will fit a 9cm grid. The guns were easy, each gun and crew is a unit but a few crews needed some uniform updates to conform. The infantry easily fit 12 figures to a square, 2 45mm bases each holding 6 figures (having serenditpitously bought just such bases several years ago). The cavalry are turning out to be a pain because the biggest unit of galloping cavalry that I can squeeze into a square is a single rank of 4 tightly packed figures on 45x60mm bases so cavalry will be in 4 man squadrons again, once I make more bases. For some reason I have only found a handful of these particular bases, just to enough to prove that I did by a bag once. I won't bother with blurry, dimly lit pictures for now but pass on to an issue that I've been struggling with, a direct outcome of my decision to cut down the table size. Its a decision to return to Konigkrieg/WRG style 12 man units after years of larger units. 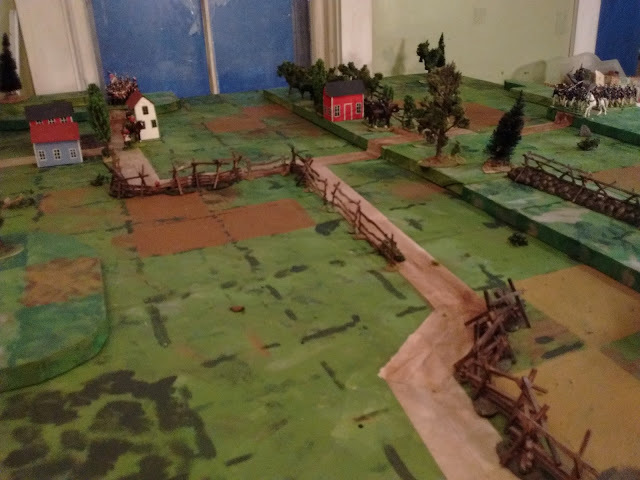 The small units don't have the look of larger units but it works from a gaming POV since I can shrink the ground scale and field more units on the same table as opposed to being confined to skirmishes between opposing brigades or going the Grant route of fielding a battalion per brigade without changing ranges. Its a choice and it needs more testing to reassure me but it will allow me to fight battles the size of Lundy's Lane or Palo Alto or even midnight Moodkee reasonably to scale with the right nuber of units. The plan to get the late 19th Century Atlantican affair going is gathering steam. Oberhilse already has plenty of troops on hand, based and ready, enough for most scenarios with more in reserve. The only key deficit is a period appropriate General and Head Quarters but I have figures on hand so that will soon be resolved. 4 guns, 6 cavalry, 16 infantry "units". This review of organization has reminded me of an unresolved (aka ignored) issue. When I started painting up WWI figures in 2014 I decided to paint up "battalions" of 4 companies each of 4 figures. This meshed nicely with the 16 figure battalions that I was using for my earlier armies. However, a WWI scenario with 8 such battalions deployed in open order would crowd my table and was too many units to paint and store given the variety of armies I was thinking about doing, so I cut that down to 2 x 4 man 1/2 battalion units per scenario unit. 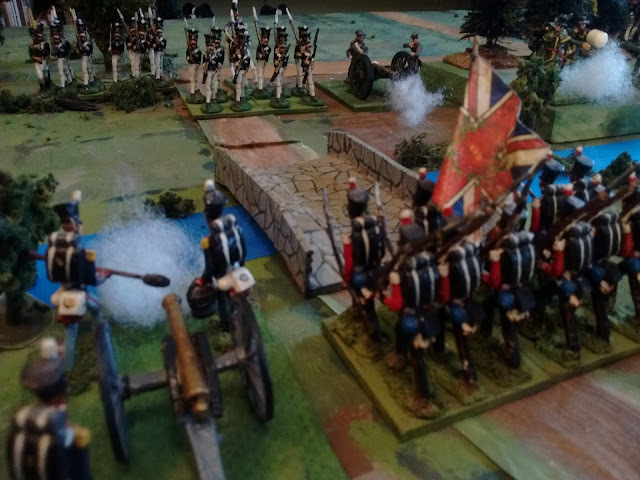 Since then Oberhilse has remained painted in groups of 16 but acts in groups of 8 (2x4) while Faraway has been painted in "battalions" (no game role) of 8 figures in distinct uniforms. Putting on my Kriegspiel hat and taking a ground scale of roughly 200 yards per square this worked perfectly scale wise with battalions occupying 2 squares if deployed or in road column and a single square in mass and I could fit modern artillery onto my tabletop. All good so far but it also meant that I was going beyond the planned brigade sized games towards division sized games. 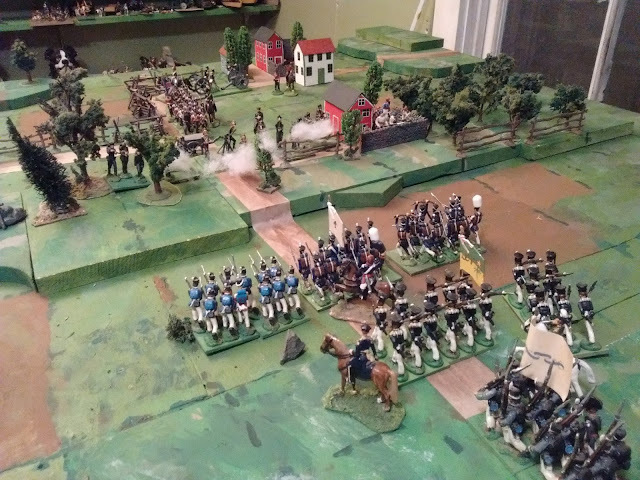 It took a few months to confirm that most of the scenarios that I liked were aimed closer to actions of brigade size at the largest with many being smaller and that the rules needed more complex command rules or multiple players before a game might feel like a late 19th/early 20th C Division level action. I didn't intend to play Kriegspeils though, I had meant to play something more like, well, say Little Wars crossed with Battlecry or something on that level. Work on the rules continues with a revisit of moves and ranges vs scenarios instead of vs scale as well as a revisit of the command and rallying rules vs the desired flow and player focus. I spent some time today staring at the existing Faraway units and contemplating the reources needed to update the existing units to 4 companies and the consequences on rules and background story. At the same time I pondered the impact of the recall to duty of my 54mm Britans. As a result I'm taking the plunge and recommitting to the original plan of 4 company "units" grouped into battalions with a commander. This means my "armies" will only have 4 "battalions" of infantry for the early period plus a few battalions in the new drab uniforms, primarily for the "Colonial" theatres of war. This means there is no room for my planned Guards inbearskins or Highlanders but since both of these appear in my 54mm inspired by the NorthWest Rebellion campaign, I'm OK with that. There still might be a 40mm highand battalion in drab in time. First however, in the absence of a re-release of Scruby Colonial, I have begun work on converting Zinnbrigade Germans into redcoats in Pith helmets to flush out the existing 8 figure Scruby unit. The next unit might be a firing battalion in spiked helmets, again converted from Zinnbrigade Prussians. The sticking point is how Oerberg and Hougal fit in, especially with the NW Rebellion game filling some of the same space as early Oerbeg campaigns and with the shortage of suitable Oerberg figures. I am leaning towards a 19thC Oberhilse-Farawy 1880 war fought in full colour before the Hougal Revolt and an early 20th C Oerberg war with a expeditionary force from Oerberg in their new fieldgray uniforms vs drab Faraway troops. That leaves room for something in the middle with a mix of the two to show the evolution. With that resolved, I am finally free again to convert and paint, knowing what is needed and what it should look like. 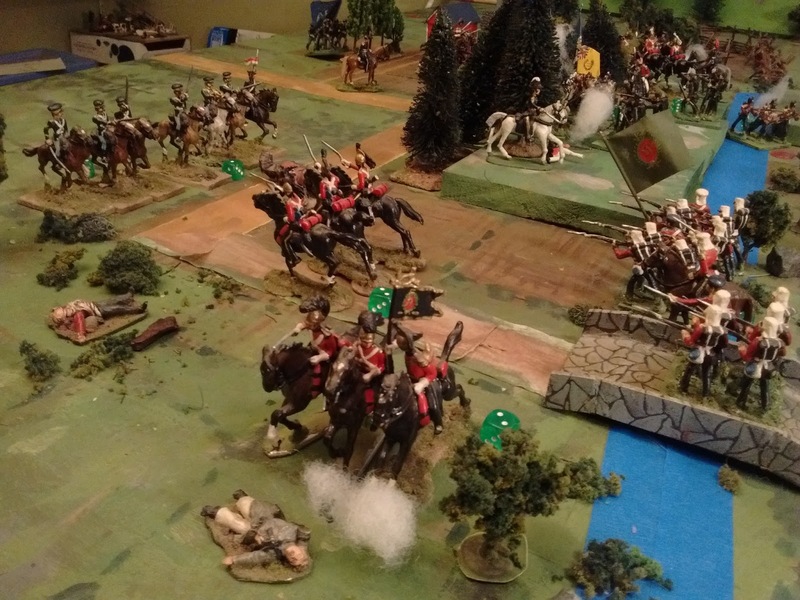 The OHW scenario I chose for my 40mm Square Brigadier game was Surprise, inspired by Quatre Bras. As before I laid it out with each 9cm grid representing a 3" square on the map. By happy coincidence this ended up making the movement equivalent though my ranges were shorter. Based on that ground scale each 6" wide infantry or cavalry scenario unit became 2 of my 1 square units but artillery remained 1 for 1. In addition to the major terrain features I added some minor bits to make it look more like Atlantica. The small stand alone lake without a stream to feed it or drain it or even a fringe of vegetation was a minor puzzler. If there had been farms or villages about I might have thought artificial duck pond or golf course water hazard while a desert setting might have suggested a water tank or oasis. Eventually I decided to go with a slough or stagnant pond in a slight dip in the ground surrounded by boggy ground and vegetation rendering 4 squares impassible while obscuring ing line of fire. NOTE: (warning?) The account of this Square Brigadier game has been done in the picture captions. The rest of the text is just me babbling about rules and general hobby stuff. Turn 5. A black chance card has frozen Red's cavalry, Black's cavalry has reached the vital crosroad while so far his infantry is more than holding its own. Still the day is only 1/3 done. For the last few years I have been seesawing between rolling for initiative or rolling for orders (number of group moves that turn). I've also been using Chance Cards off and on. Recently I started using the chance card deck as a way to track number of turns played since I am lousy at remembering to tick them off or move a marker. Of course I still forgot to turn a card sometimes. I finally hit on the idea of using the deck to determine who gets first move as well as being a chance deck and tracking turns. Works brilliantly for me. I can't proceed without determining initiative so the deck never gets forgotten. Red was heard muttering about stacked decks at one point since he only got the initiative about 3 turns and Black got all of the chance cards but them's the breaks. The dice weren't always more impartial. Gratuitous shot of the 4.7" going into action with a Royal Artillery crew. They were obviously well trained and equal to the task. Premier etoile. For the last 20 years almost all of my rules have treated "hits"as representing mostly a loss of cohesion and allowed units to recover from them by "rallying". Recently I started dropping it since unless one side was being crushed, it was hard to stop units rallying indefinitely which in turn made it harder to reach a conclusion. Recently I have started paying more attention to turn limits and shortening the usual limit. Instead of aiming for 18-24 turns I have gone to 12-15. That helps. It also helps the feel that rather than just removing units the second that they hit their limit, a new feature for me, I have gone back to forcing them to retreat and try to rally, retreating again with each failure until they succeed or leave the table. That simple combination has resolved my major headache over the last hmm 5 years? The Zouaves are driven back with losses by artillery and rifle fire. Half of them cannot be rallied and retreat off table. Red's cavalry sweep has been thrown back by Black's cavalry, well by the Hougal Chasseurs really. The Guard Lancers focussed on looking pretty. Part of last years plan was to reduce the number of major collections that are active. The reduction was successful in that I am now down to 8. 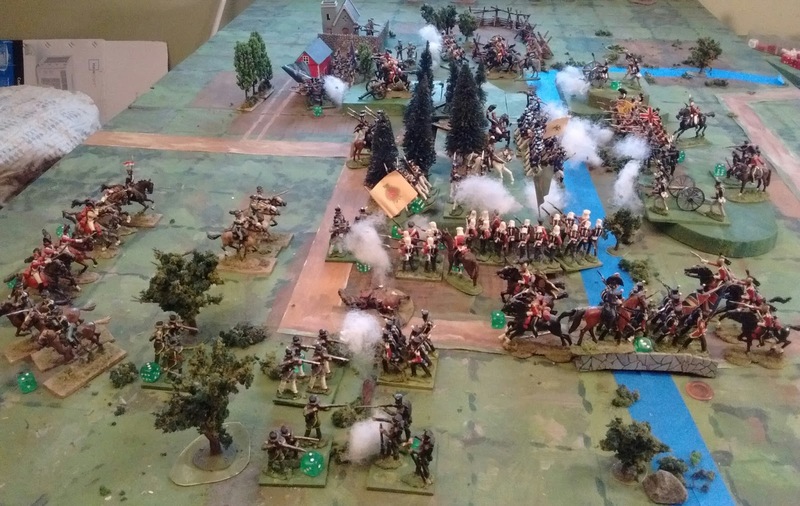 (Prince Valiant, 5 Kingdoms, 16th C, NQSYW, Atlantica 1812-1850, ACW, 54mm NW Rebellion, Alantica 1880-1910, ) There are also a few "Game in a Box" things that each fill the same niche as one of the above, eg my 30mm "Quebec 1759", tucked away in the cupboard mostly because they don't take up much room and don't look easy to sell. 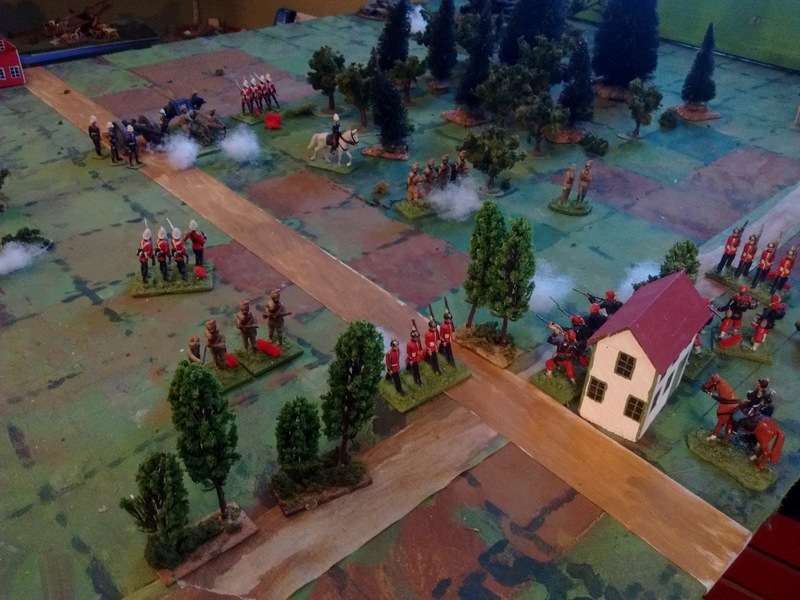 Gratuitous close up of the 2nd and 4th Companies, Hougal Zouaves, around turn 7. These guys fought all day against heavy odds and were still hanging on to the inn at the crossroad at the end of the day. Deuxieme Etoile. Part of the plan was also to make sure that each major era in weaponry was covered as well as each of the levels of game that might interest me, all without duplication. I didn't quite get there. All of the games in boxes do duplicate the niche occupied by one or the other of the main collections but they aren't in the way. One major technique that I have used to cover all angles of interest without duplication has been to convert strict historical collections to fictional ones so my Atlantican musket forces will be able to play games inspired by Napoleonic wars, War of 1812, 1837 rebellions, Sikh Wars,Mexican American War and so on. The uniforms won't be right but the rest can be. 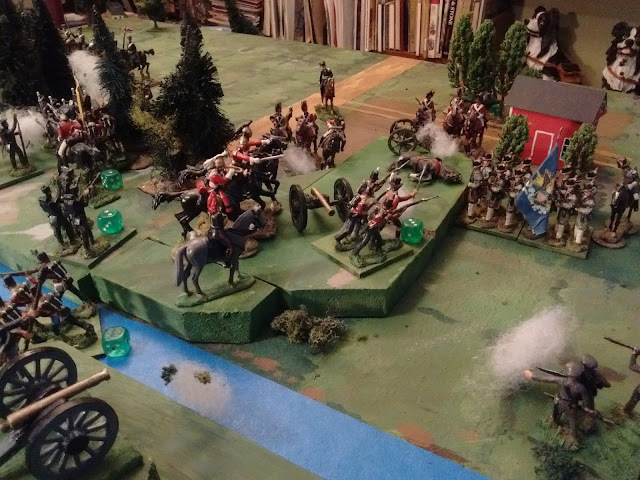 More to the point, this 40mm Atlantican game and the preceding 54mm NW Rebellion game both fit the same niche. This isn't surprising since its my favorite period and I originally set out to do the Atlantica thing with 54's and the remaining troops are the original ones, the ones in the style I wanted before I was seduced temporarily by the outflow of larger, more detailed, chunky/clunky plastic and metal "New" toy soldiers that soon lost their appeal and took up too much room. Since I have both and can't seem to square myself to get rid of either, I've decided that I may as well use 'em both. Hopefully the different settings and troop choices will provide enough differentiation. Umhh... 8 turns later.... after much advancing, desperate stands and more desperate rout, it occurred to me that I should take another photo. It is the 2nd to last turn and Black is still hanging on to the crossroads. 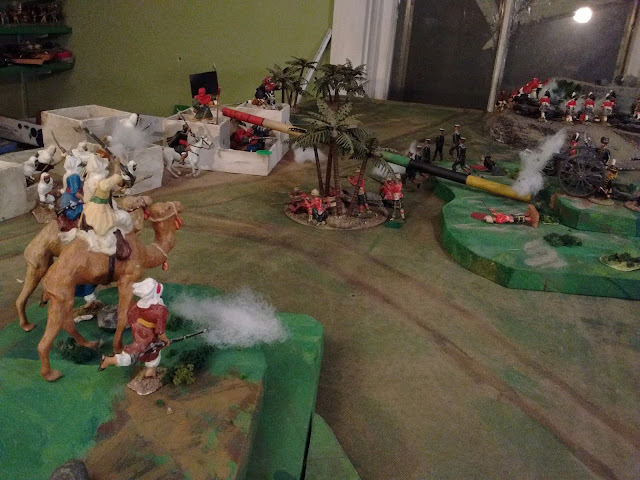 Off camera, Red's cavalry Brigade has been broken. The infantry has taken a pounding but its still in the game. Frontal charges are a desperate gamble but they seem to be the only hope as the light fades. Lastly, a look ahead. I'm slowly making progress on repainting the table and have started to work on squaring the hills to the grid. Terrain for the Square Brigadier games in particular is going to be my focus for the next while with some figure painting for relief esp for the 2 Square Brigadier collections and the 25mm Fantasy Medievals. I am also going to get a good copy of the Square Brigadier put together as well as a short summary. The musket guys will probably stay on the shelf until summer or fall since they need so much work on figures and rules but there might well be a midwinter/early spring Charge! game, esp if I finish some new troops as well as an ACW game if I get a bit more painting done on that front. There should also be more work on the various background summary pages now that I am getting more focussed. The last card flipped the initiative to Red giving them a double move just when they needed it most. The deck is forgiven. 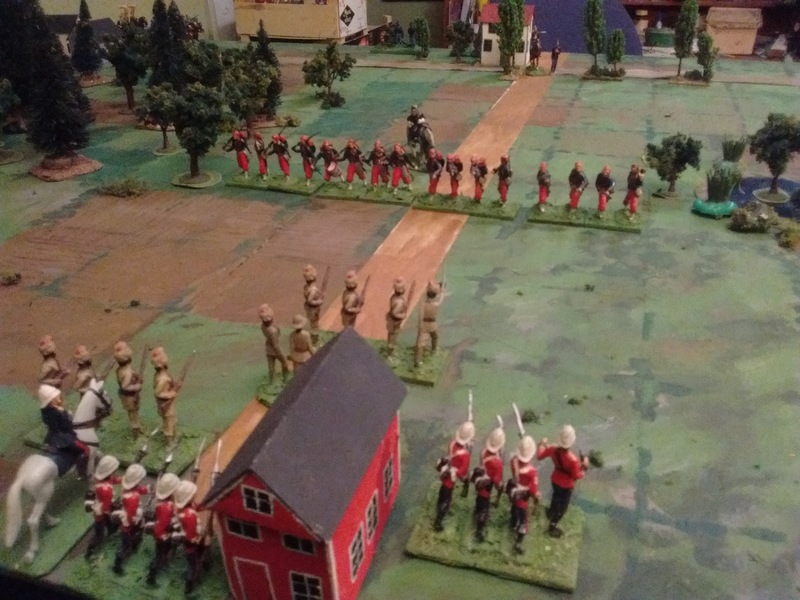 All along the line Red's infantry surged forward with the bayonet. 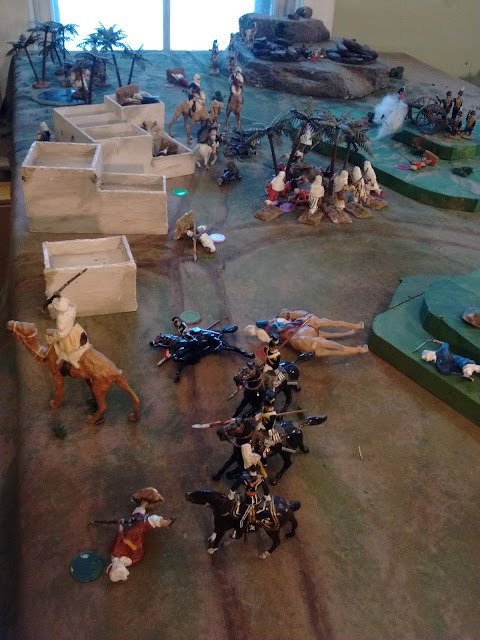 The Zouaves easily repulsed the rash attack on them but in the center the 2nd Black Battery and a company of Oberhilse line infantry that had arrived on turn 9 were driven back by a flurry of 5's and 6's after being battered by long range artillery and rifle fire for several turns. If they rally in the back half then Black would win. Alas they had taken 2 hits over their morale point and both were forced off table. Black was left with 3 out of 10 units and 1/2 the crossroads meaning forced reteat off table while Red had 7 out of 10 and the other half so a win by a Nose. For routing the enemy and taking the crossroad on the last turn, 'A'Company of the Royal`s gets Troisieme Etoile. Atlantica in the 1890’s, before the Hougal Revolt. So I dipped into OHW, pulled out a scenario, laid the table, hauled some shiny soldiers off the shelf and.......time was up. Tomorrow, a game of Square Brigadier.